Constance Brown-Riggs is a nationally recognized certified diabetes educator with more than twenty-five years' experience. She is the owner of CBR Nutrition Enterprises, a nutrition consulting and counseling service and is a former Assistant Adjunct Professor at Suffolk County Community College for the Dietetic Technician Program. Additionally, Constance is a past spokesperson for the Academy of Nutrition and Dietetics and past president of the New York State Dietetic Association. 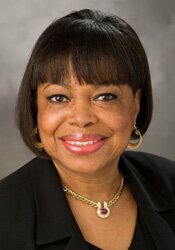 Currently, she serves on the board of directors for the American Association of Diabetes Educators. Her professional honors include the Award for Excellence in Consultation and Business Practice from the Academy of Nutrition and Dietetics, the Distinguished Dietitian Award from the New York State Dietetic Association and Diabetes Educator of the Year from the Academy of Nutrition and Dietetics, Diabetes Care and Education Practice Group. Adding to her achievements, she also created the Diabetes Soul Food Pyramid and is the author of The African American Guide to Living Well with Diabetes, Eating Soulfully and Healthfully with Diabetes and the forthcoming book, Enjoying the Flavors of the World: A Diabetes Carbohydrate and Fat Gram Guide. She also serves as an expert for dLife.com, the online companion to CNBC's premier diabetes program, she is a contributor to NBC's the Grio and she has appeared as a keynote speaker, presenter or panelist at conferences across the country. Financial: Constance Brown-Riggs is president and owner of CBR Nutrition Enterprises. She receives a speaking honorarium from PESI, Inc.
Nonfinancial: Constance Brown-Riggs is a member of the American Association of Diabetes.